Here are some snazzy birthday facts about 2nd of August 1912 that no one tells you about. Don’t wait a minute longer and jump in using the content links below. Average read time of 10 minutes. Enjoy! What day was my birthday Aug 2, 1912? August 2, 1912 was a Friday and it was the 215th day of the year 1912. It was the 31st Friday of that year. The next time you can reuse your old 1912 calendar will be in 2024. Both calendars will be exactly the same! This is assuming you are not interested in the dates for Easter and other irregular holidays that are based on a lunisolar calendar. There are 104 days left before your next birthday. You will be 107 years old when that day comes. There have been 38,977 days from the day you were born up to today. If you’ve been sleeping 8 hours daily since birth, then you have slept a total of 12,992 days or 35.57 years. You spent 33% of your life sleeping. Since night and day always follow each other, there were precisely 1,320 full moons after you were born up to this day. How many of them did you see? The next full moon that you can see will be on May 18 at 21:13:00 GMT – Saturday. Fun stat: Your first one billion seconds (1,000,000,000) happened sometime on April 10, 1944. If a dog named Timothy - a Irish Wolfhound breed, was born on the same date as you then it will be 523 dog years old today. A dog’s first human year is equal to 15 dog years. Dogs age differently depending on breed and size. When you reach the age of 6 Timothy will be 45 dog years old. From that point forward a large-sized dog like Timothy will age 5-6 dog years for every human year. French Revolutionary Wars: The Battle of the Nile concludes in a British victory. Fall of the Ottoman Empire: An unsuccessful uprising led by the Internal Macedonian Revolutionary Organization against Ottoman Turkey, also known as the Ilinden–Preobrazhenie Uprising, takes place. The first general strike in Canadian history takes place in Vancouver. Albert Einstein and Leo Szilard write a letter to Franklin D. Roosevelt, urging him to begin the Manhattan Project to develop a nuclear weapon. What does my birthday August 2, 1912 mean? 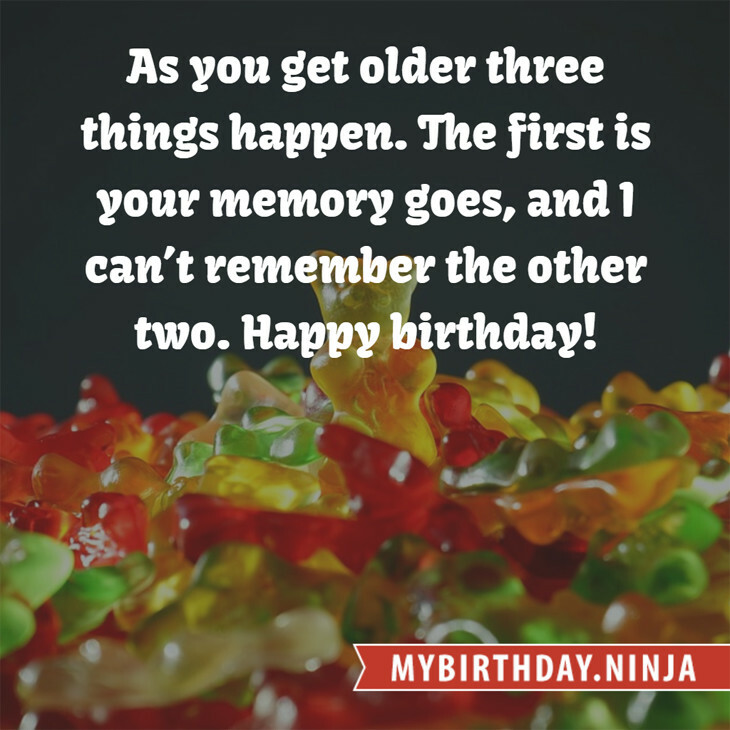 Your birthday numbers 8, 2, and 1912 reveal that your Life Path number is 5. It represents progress, adventure and opportunity. You possess the curiosity of a cat and long to experience all of life. The following celebrities also have the same life path number: Don Barnes, Jed Montero, Robert Paquette, Donald "Duck" Dunn, Hitomi, Laila Elwi, Nancy Olson, Dave Williams, Bert Parnaby, Kenta Hamano. 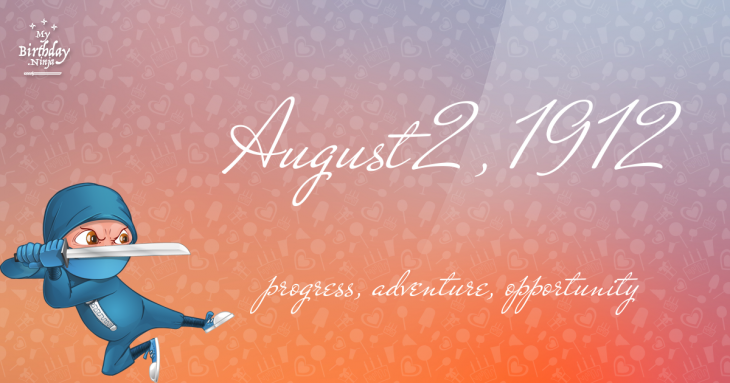 What is the birthday horoscope for Aug 2, 1912? The Western zodiac or sun sign of a person born on August 2 is Leo ♌ (The Lion) – a fixed sign with Fire as Western element. The ruling planet is Sun – the center of our universe. According to the ancient art of Chinese astrology (or Eastern zodiac), Rat is the mythical animal and Water is the Eastern element of a person born on August 2, 1912. Fun fact: The birth flower for 2nd August 1912 is Poppy for preparedness. What is the Love Match for Aug 2, 1912? When it comes to love and relationship, you are most compatible with a person born on April 26, 1907. You have a Love Match compatibility score of +123. Imagine being in love with your soul mate. On the negative side, you are most incompatible with a person born on February 11, 1934. Your incompatibility score is -173. You’ll be like a cat and a dog on a love-hate relationship. Arf-arf, I want to bite you. Meow-meow, stay away from me! What is the popular baby name on 2 Aug 1912? Here’s a quick list of all the fun birthday facts about August 2, 1912. Celebrities, famous birthdays, historical events, and past life were excluded. Try another birth date of someone you know or try the birthday of these celebrities: December 19, 1991 – Declan Galbraith, English singer-songwriter; February 19, 1949 – Eddie Hardin, English singer-songwriter and pianist (The Spencer Davis Group and Axis Point) (d. 2015); February 9, 1961 – Jussi Lampi, Finnish actor, singer, and drummer.